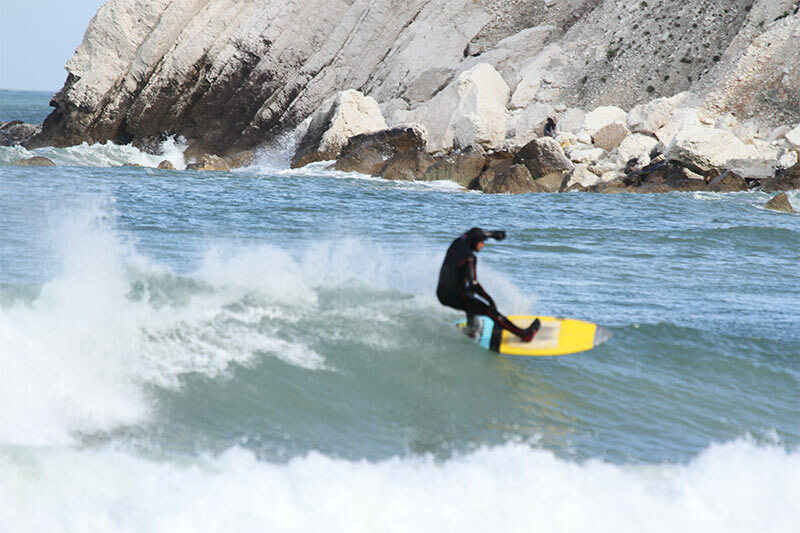 When the Scirocco starts to push from the Mediterranean or when the Grecale violently arrives, Portonovo transforms itself, becoming a place of unforgettable storms and attracting surfers from all over the world. Although the Adriatic Sea is not known by most for the waves is an area that offers periodically excellent conditions for surfing. 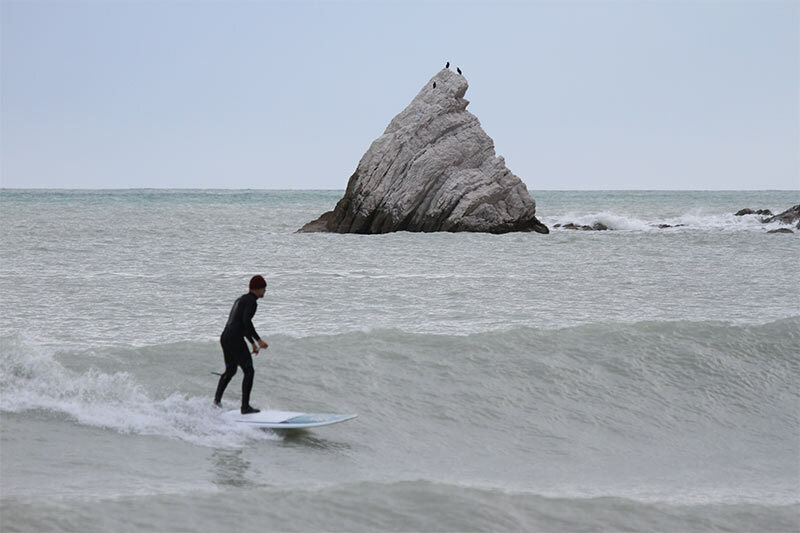 If you explore the Conero Riviera on a rough day at sea at any time of year, you will surely find someone who is enjoying the waves! The shape of our seabed is particularly suitable for the formation of waves, thanks to the exposure of some bays towards the ideal sea sectors from which the greatest perturbations come. Compared to the summer season where high pressure and good weather master, winter and autumn are certainly the most frequent periods of the year, thanks to the large perturbations that bring ideal currents for the formation of waves. The enemy is the cold, but is always overcome by the power of passion, the grit and the irrepressible desire to experience that indescribable feeling of sliding on the water. 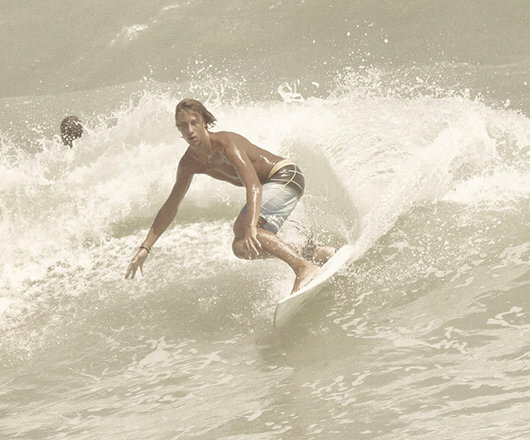 Although the summer is not characterized by the same winter perturbations, there are several days to surf, for more in costume! But what surf quality do we talk about? In general, the pipes coming from N / NE / ENE generate waves not above 2 meters, on average 1.5 meters, which go off in a few hours because of the little fetch (wave mirror for the generation of waves). When the sea storm comes from S / SE / ESE instead, we have a wave growth that happens in hundreds of km … giving the possibility to the waves to grow, distance and acquire power! As for Windsurfing, the sirocco is a blessing for us; with certain conditions, with the right direction and the right push …. can reach walls of water over 3 meters! The Conerostyle School offers courses to learn the Surf, for children, for beginners, amateurs but also veterans who simply want to improve their technique. In addition, the Conerostyle School has rental material for the wave days. The school will have 5 days of OPEN DAY throughout the season (1 per month) where, in a few hours, we will present the surf to those who have never heard of it, we will explain the tables, the materials, we will tell the story, the legends, how the sea works, what binds us so much to water and how this indescribable passion for this sport was born. The dates of these meetings will come communicated through the site and through the social media of the Conerostyle School. 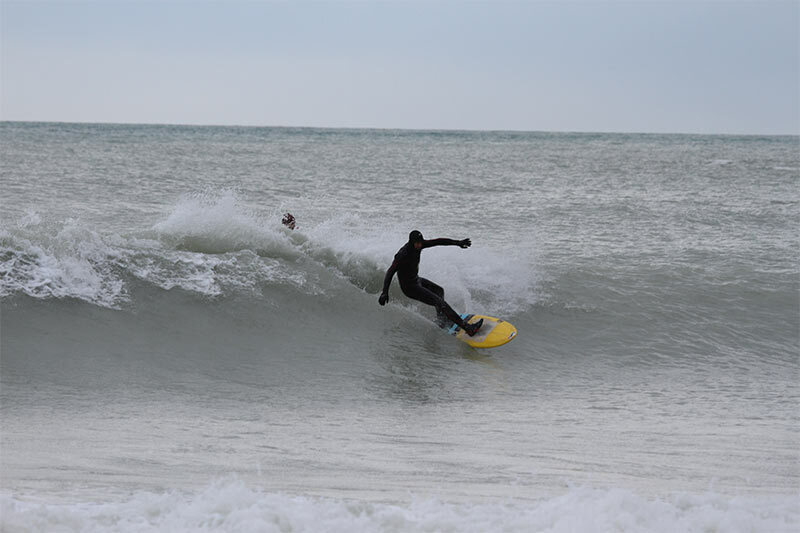 For those who enroll at level 1, and are therefore a beginner in surfing, the school plays the lessons in total safety by organizing everything necessary to the headquarters of Portonovo; alternatively, if necessary, the lesson will be held at the coast of Senigallia (An). The Conerostyle School will prepare the means of transport to reach the place of the lesson, starting from its headquarters (Portonovo / Marcelli) as indicated in the price list. In the hours indicated as theoretical / introductory, it is good to underline the importance of safety, but above all the fundamental notions for living at sea; In addition to the technicalities of the sport in question, our aim will be to increase the aquatics in your children, teaching them the most varied and different aspects of the sea, to know him, to love him, to be able to respect him and to live forever. So we will teach children to swim, dive, not to be afraid of water, to put their heads under, to take and hold their breath, but also how perturbations, winds, currents and tides work … and then bring them above the table. The materials to participate in our courses will be entirely provided by Conerostyle School. Courses are held in Italian and English. If a course can not be completed due to lack of waves, the school will issue to the student (regularly enrolled) a voucher to recover the lesson that was not carried out. 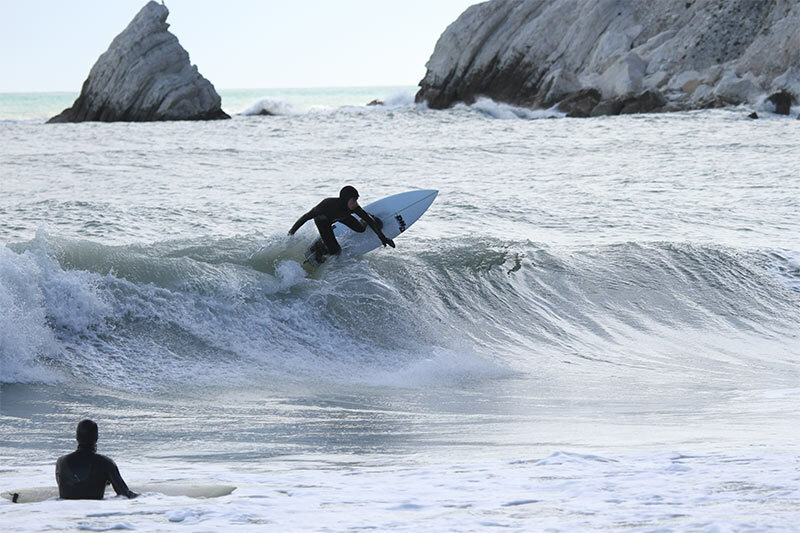 The courses for SURF activities are available at the following locations: Portonovo. The Conerostyle School has the best materials available on the market for rental. We are equipped with a large variety of material based on the different weather conditions and at your level. But in addition to this interesting opportunity, the rental formula is a magical antidote to stress: no mega-loads on your car, stop need to have a place at home where to leave the material or have to carry it behind. You can reach the beach by scooter or bus without having to buy a surfboard. 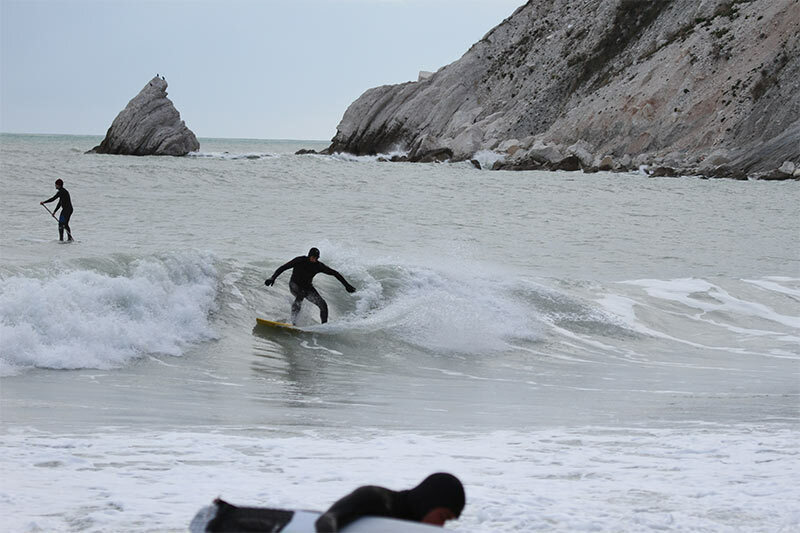 The rental of Tables from SURF is currently available at the headquarters of: Portonovo. 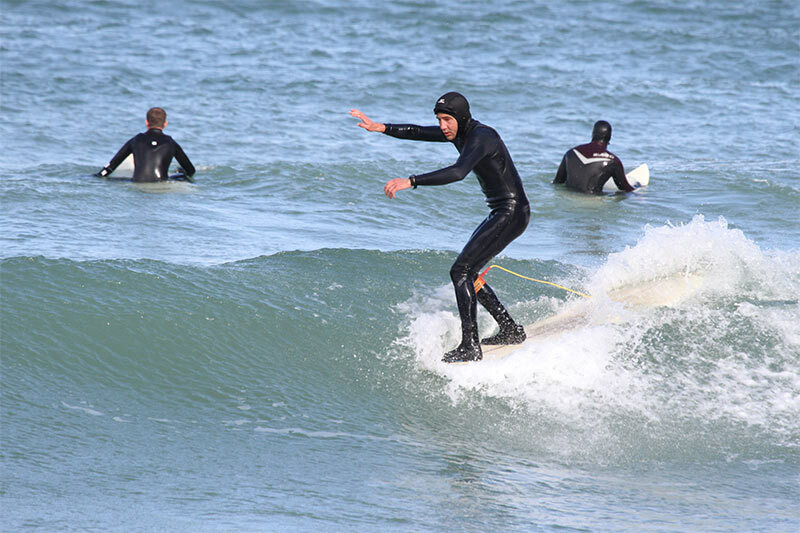 Our proposal for “skate surfing” aims to provide an excellent technical approach to skateboarding, to then be transferred to the surf technique, being extremely complementary sports. Courses for those who have never used a skateboard, but also for those who are already able to skate, but want to improve their surfing technique. All the material necessary for the activity is provided by the ASD Conerostyle school. Beginners: lessons will be held at the skating rink of the Palazzone (Pietralacroce); as soon as the skating rink works are over, we will move there. Amateur / Experts: lessons will be held at the skate park of Q2 (Ponterosso). The first lesson, for educational reasons, will also take place at the “palazzone” skating rink.